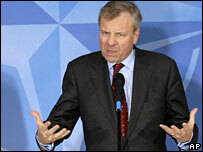 Nato Secretary General Jaap de Hoop Scheffer has said the failure of Nato's mission in Afghanistan could result in terror attacks in Western countries. The alliance's mission in Afghanistan is not failing, but big challenges remain, Mr de Hoop Scheffer added. He was speaking ahead of a Nato defence ministers' meeting in Lithuania. His warning was echoed by US Secretary of State Condoleezza Rice, who is visiting Afghanistan with UK Foreign Secretary David Miliband. On the unannounced visit, Ms Rice told frontline troops in Kandahar that "winning here in Afghanistan so that there can not be the attacks against our cities and against our people that originated here - that's the core of the modern fight". The visit comes amid tensions over the Nato mission in Afghanistan. The US and UK have been urging other countries to share more of the combat burden in the south of the country. Relations between the Afghan government and the Nato allies operating there were strained by President Hamid Karzai's assertion that despite British efforts, the situation had worsened in southern Helmand province where most UK forces are based, says the BBC's Alastair Leithead in Kabul. President Karzai also blocked the appointment of the UK's Paddy Ashdown as a UN envoy. Meanwhile, a string of studies has warned that Afghanistan risks becoming a failed state without more effective action. Mr de Hoop Scheffer said he would be spelling out to the Nato ministers that member nations had to do more to train and equip the Afghan army. The challenges that remain include the adequate training and equipping of the Afghan national army, but Nato's mission in the country was one of necessity, not choice, he added. "This is the front line in the fight against terrorism, and what is happening in the Hindu Kush matters, because if terrorism is not dealt with in Afghanistan, the consequences will be felt not just in Afghanistan and the region, but also in London, Brussels and Amsterdam," he told the BBC. It is unlikely, however, that more combat troops will be offered at the two-day Lithuanian meeting, although officials are hoping it will pave the way for further contributions to be made at Nato's summit in Bucharest in April, says the BBC's Caroline Wyatt in Vilnius. The squabbling of recent days has again highlighted divisions within Nato over burden-sharing in Afghanistan, our correspondent adds. Ms Rice and Mr Miliband arrived in the Afghan capital, Kabul, on Thursday after visiting troops from a number of different nations fighting in Nato's International Security Assistance Force (Isaf) in Kandahar earlier in the day. On Wednesday, Ms Rice and Mr Miliband held talks in London, where they discussed ways of getting Nato allies to share the burden of the fighting in the country's south. Earlier, US Defence Secretary Robert Gates said Nato's future was at risk due to the refusal of some members to participate to the alliance's mission. Mr Gates said that without more, the willingness of those engaged in combat would disappear and Nato might become a "two-tier alliance". However, he said he would be spelling out to Nato defence ministers in Vilnius that member nations must do more to train and equip the Afghan army. On Tuesday, a London-based think-tank, the International Institute for Strategic Studies (IISS), warned that Afghanistan faced becoming a "failed state" if operations by Nato were unsuccessful. The IISS report echoed the tone of a number of other studies in the last week, including one from the influential US-based Afghanistan Study Group. Most of the fighting in the volatile southern provinces is being done by troops from the US, UK, Canada and the Netherlands. Canada has added to the pressure by threatening to remove its forces from Kandahar next year, unless other countries come up with more troops. Last week, the US government sent letters to European states pressing them to send troops to southern Afghanistan. Mr Gates reluctantly agreed recently to send an extra 3,200 US marines to the country, having previously suggested the extra troops should be provided by other countries. All 26 Nato members have contributed troops to the International Security Assistance Force (Isaf), but many US allies, including Germany, France, Spain, Turkey and Italy, have refused to send significant numbers of combat forces to the south. The decision has created a rift between them and the US, UK, Canada, the Netherlands, Denmark and Romania, whose troops have borne the brunt of the counter-insurgency fight in recent years.